KING, Stephen. Shining. Garden City, New York: Doubleday & Company , 1977. 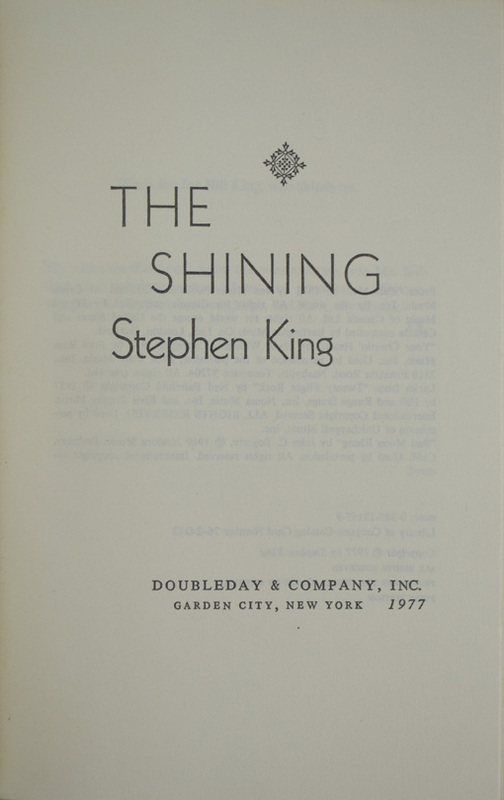 First edition, first issue (with ”R49”on last page of text). Octavo (8 1/8 x 5 7/16 inches; 207 x 139 mm). [viii], , 4-447, [1, blank] pp. Black cloth back over tan paper boards. Lettered in gilt on the spine. Bottom edge speckled brown. With original pictorial dust jacket. Bright and fine.